Just weeks before their first visit overseas, we spoke to So Many Dynamos guitarist, Griffin Kay about the band's origin, signing to Vagrant Records, working with Death Cab For Cutie's Chris Walla, drinking a reasonable amount of Belgian beer and more. Alter The Press: How does it feel to finally bring the band overseas? Griffin Kay: I am estatic about our upcoming tour overseas. This will mark the first time we have ever flown anywhere to play shows. ATP: Anywhere in particular you are looking forward to play? Griffin: The idea of showing up one day in a town and not knowing anyone and leaving the next day (hopefully) with a handful of new friends is still appealing to us, so in that regard we're excited about all the shows. But to be more specific, we are looking forward to the show in Amsterdam quite a bit. The next day our show is less than an hour away, so we are hoping to take in some of the city. I really want to try as many Belgian beers as I reasonably can for when we play in Gent. Griffin: Our previous bands dissolved around the same time. Those of us who were interested in playing music got together and started writing and recording. A few months later we embarked on our first self-booked tour. ATP: Where did the name 'So Many Dynamos' come from? Griffin: They were interested in us after hearing our previous record, “Flashlights.” They approached us while we were recording “The Loud Wars” and our dialogue snow balled into us signing to Vagrant. ATP: 'The Loud Wars', your Vagrant debut, was produced by Death Cab For Cutie's, Chris Walla. How was it working with him? Griffin: Working with Chris was really inspiring and a lot of fun. He synched in with our group dynamic remarably well, allowing him to get the best performances out of us. He seemed to have an endless bag of tricks he would pull out when we would hit a wall and that helped keep the ideas flowing. There were also lots of laughs and joking around, which helped ease our anxieties and kept the mood light. Griffin: We recently got a new guitar player, Nathan, and he has been a great addition to our group. We've been writing for another record and his contributions have gone above and beyond any expectations we initially had. 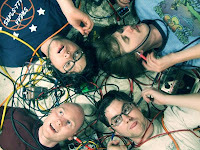 ATP: What was was it like touring with Maps & Atlases? Griffin: I had a lot of fun on our two tours with Maps & Atlases. They are one of those bands that, even after listening to their records hundreds of times and watching them night after night, I find myself loving more and more. They consistently left me impressed and surprised. They are also good friends, so getting to hang out with them every day was awesome. If bands could get married to each other, we would be in a long line of suitors for Maps & Atlases. ATP: What's planned after the UK/European tour? Griffin: When we get home from our tour we are going to increase our focus on writing a new record. 'The Loud Wars' is out now on Vagrant Records.